Sports Rally, a student club at Salt Lake Community College, invites all students to stay active and have fun this summer through its various pick-up games and other events. 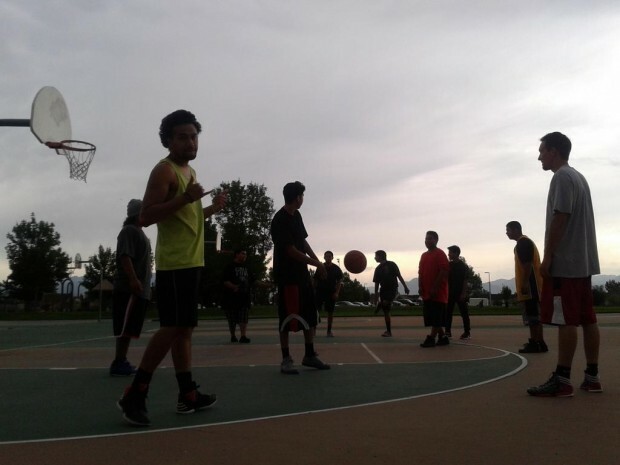 For students who don’t have a team to play for, Sports Rally organizes pick-up games for basketball, football and softball at sites around the Salt Lake Valley, including the Lifetime Activities Center (LAC) at the Taylorsville Redwood Campus. SLCC students must swipe their OneCard near the LAC information desk for free access into the gym. All non-SLCC students pay $2.25 each visit. While pick-up basketball is far more casual than league play, some basic rules are applied as a way of keeping the games fair and competitive. Teams are assembled through a shootaround. The first five players to sink a basket make up the first team while the next five makes up the other team; any remaining players wait their turn. Street rules apply to fouls. No foul shots are given; instead, the fouled team simply checks the ball out from the 3-point line and continues on offense. Out of bounds and double dribbles/travels are called out as a way of showing respect and discipline towards the opposing team. Oftentimes the first team to reach 21 points is the winner, but this depends on the amount of students that want to play. “Sports Rally is an organization, kind of like Jr. Jazz,” says SLCC student and pick-up basketball player Alan Kaziz. Sports Rally club president Jesse Valdez is in charge of putting together the pick-up games. Fellow SLCC student Teamin Sarwar has participated in Sports Rally pick-up basketball games since the fall of 2014. He plays basketball to have fun and to get a workout. “If you’re really interested in getting crossed over, you know where to come,” says Sarwar. Sports Rally has a Facebook group which posts regular announcements on pick-up games. All students are encouraged to join the club and help grow the pool of players available. If enough interest is generated, other recreational activities, like hiking, are proposed as group events. Sports Rally also has organized teams for softball, basketball, bowling and tackle football. Tryouts and other information can be found on the club’s Facebook page. Globe staff contributed to this story.